Alpine white with black Nevada leather upholstery, Only covered 46k miles backed with full BMW history, Cost new 39k with 4k extra's, Extras include - 19" M double spoke alloy wheels in black finish, Sun protection glass, Auto dimming and folding door mirrors, Media package - Business advanced, Satellite navigation, Enhanced bluetooth telephone functionality with USB audio interface + voice control, Heated front seats. STANDARD FEATURES:- Auto dimming rear view mirror, M aerodynamic bodystyling, M sports suspension, Rain sensor including auto headlights activation, Cruise control with brake function, BMW professional radio/CD/MP3, Dual zone automatic air conditioning, Anthracite headlining, Front centre armrest with storage compartment, Front sports seats, M leather gear-knob, M leather multifunction steering wheel, Hill descent control, Ambient lighting plus much more! The pioneer of the Sports Activity Vehicle class, the BMW X3 has continued to push boundaries. A true all-rounder, it offers sweeping exterior contours matched by a refined and spacious cabin. The interior is equipped with a host of innovative technology features, while the ride itself is responsive and enormous fun. 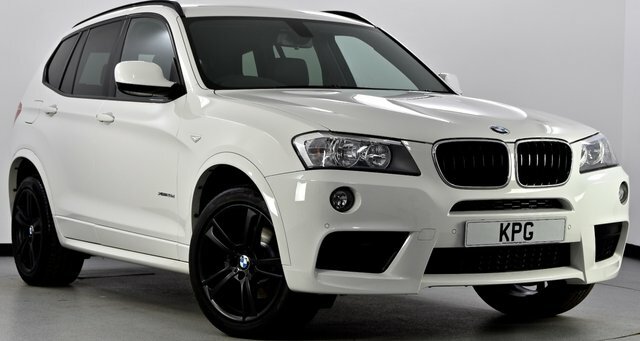 Take a closer look at the range of used BMW X3 models for sale in Bathgate right here at Kaim Park Garage Ltd. We're a leading supplier of used cars in Bathgate and you can rest assured that we'll do everything possible to help you find the right vehicle to suit your budget and lifestyle. Contact a member of the team now to find out more.